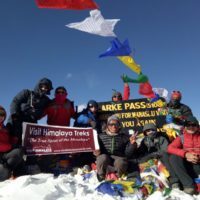 Norbung Kang Peak Climbing – Norbung Kang Peak (6085 meters) is in the lower Dolpo region and is a fairly easy and one of less-frequented climbing peak available for climbing in the Dolpo region of Nepal. 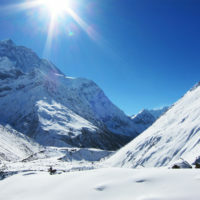 This is one of the peaks that can be a good starting for people who aspire to climb mountains in the Himalayas of Nepal. 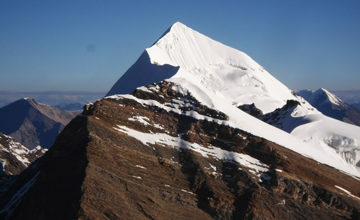 The peak lies in between the famous Shey Phoksundo and DhoTarap region of the lower Dolpo. 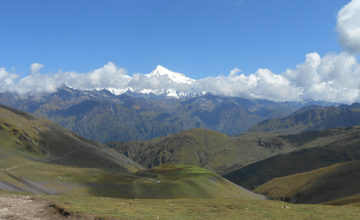 The trail follows Numa La and Baga La trail and only separated from the Yak Kharka to head towards the mountain. 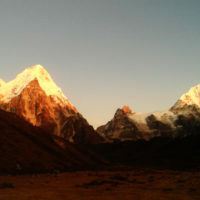 The based camp of the mountain can be reached within a few hours from Yak Kharka. 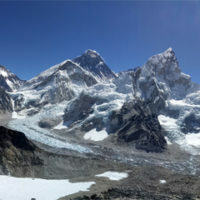 The summit of Norbung Kang can be reached within a day from the Base Camp and no higher camps are required. 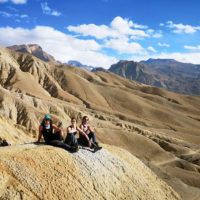 The climbing is also on a fairly comfortable slope and with some assisted fixed lines it can be a good climbing experience for someone wishing to climb above the 6000 meters. 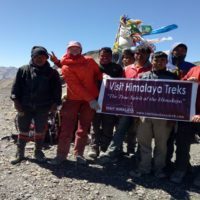 Visit Himalaya Trek organizes and makes all the arrangement for climbing the mountain. 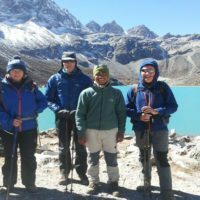 The trek and expedition crew are highly qualified and trained personnel with a good decade-long experience of climbing and trekking in the Himalayas of Nepal. 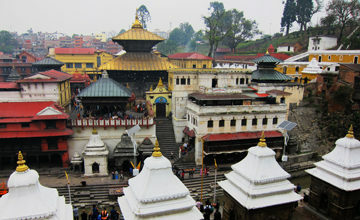 Day 01: Arrive in Kathmandu. (1350 meters). Day 03: Fly to Nepalgunj. (130 meters). 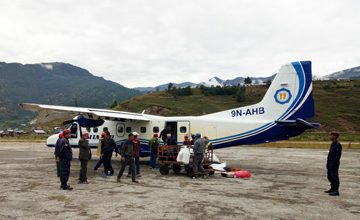 Day 04: Fly to Juphal (2490 meters) and trek to Lingdo. Day 12: Climbing Preparation day at Norbung Kang Base Camp. 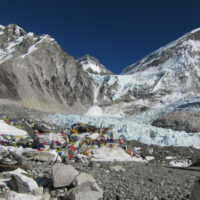 Day 13: Climb Norbung Kang (6085 meters) and back to Base Camp. 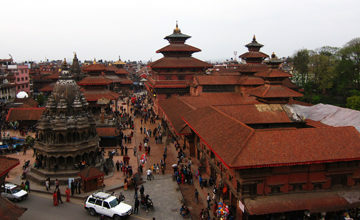 Arrive in Kathmandu. (1350 meters). Fly to Nepalgunj. (130 meters). 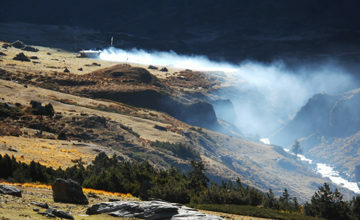 Fly to Juphal (2490 meters) and trek to Lingdo. The trail is the newly built road and stays on it all the way to Laisicap. 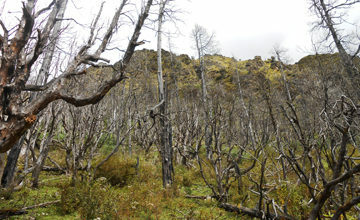 The first two hours of the day is a comfortable trek and after that the trail starts to climb steeply snaking the ridge. After 30 minutes trek, trail briefly drops to Laisicap. The trail now crosses the river and then stays gentle for next 20 minutes. Now, trail gets away from the road and climbs steeply, briefly getting back on the road. 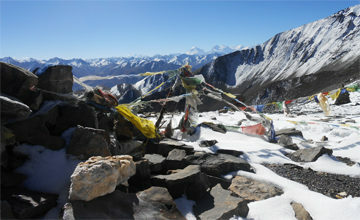 The climb lasts for an hour and a chorten marks its end. A brief gentle flat walk of 10-15 minutes is again followed by a steep climb for the next hour. The trek is now in a narrow valley and undulates for most of times with more climbs than downhill. It takes around 2 hours from the chorten to Laini. 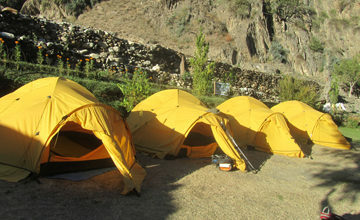 There are couples of tents by a waterfall just step before the next day’s short steep climb. The trail undulates for the most part in the morning and arrives at Toltol after an hour. The valley is quite narrow and trails keep undulating following the river. After around 3 hours the trail crosses the river and a steep 10 minute climb leads to Kesi La. After Kesi La, a drop is briefly leads to a bridge and again continues to follow the valley which is starts to be a little more wider. Another bridge follows (lots of tiny caves by the river) and a gentle climb leads to another set of prayer flags. 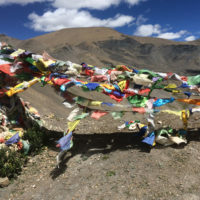 This second prayer flag is an hour away from Kesi La. A wider valley appears after the prayer flags and a long comfortable walk of around 4 hours by the stream ends at Dho. 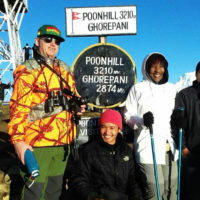 The day is used to do some acclimatization hikes around Dho as the trek enters into higher elevation in the next few days. There are several monasteries around Dho. 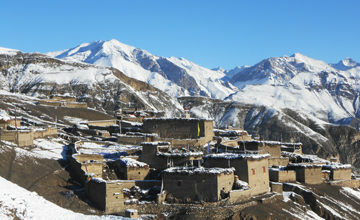 A Bon Monastery in nearby village is one of the highlights of this acclimatization day. The steep climb continues on the ridge and after 30 minutes, a brief traverse starts. Another ridge and another steep ascend follows for the next hour. The climb ends at Numa La. 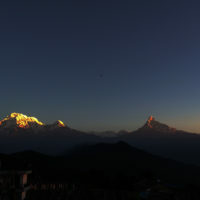 Numa La Bhanjyang offers views of Dhaulagiri Range to the East and Kagmara Range in the West. A steep descend into the main valley leads to a small stream in the bottom of the valley. The trail briefly stays with stream until it reaches a fork. Here, the trail crosses the river heads towards the left valley. A small gentle uphill traverse ends at Danigar. Danigar is a pasture at the end of the valley surrounded by towering ridges. 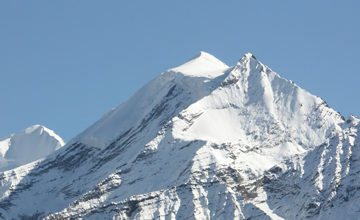 NorbuGyang is a prominent peak among these ridges that surround Danigar. The trek separate from the main trail of the Lower Dolpo Trek and now directly heads towards the mountain at Camp. Climbing Preparation day at Norbung Kang Base Camp. 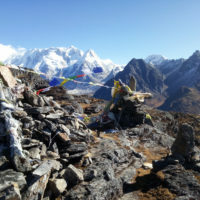 Climb Norbung Kang (6085 meters) and trek to Base Camp. The day is one of the longest and the hardest day of the trip. The climb itself is straightforward on a comfortable slope and takes around 7 hours to get to the summit. After the summit, the descent continues and passes the base camp. Following the same track we walked earlier trek to Danigar. The day starts with a steep climb on the ridge seen directly from Danigar. 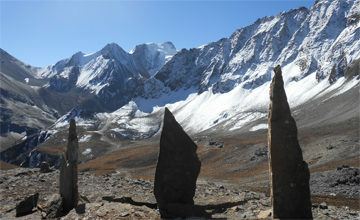 Steep climbing continues for around 2 hours and reaches a spot with some mane stones. After the spot, the steepness decreases (yet still difficult) and a traverse towards the top of Bagala starts. It takes around 40 minutes to reach Baga La from the spot with mane stones. The descend after Baga La is a bit rough and goes through boulders and scree. After an hour, a valley opens up and the trail starts to follow a stream. The stream snakes through the valley and after less than an hour, the trail moves away from the stream and starts to drop very steeply to Phedi. The descend continues farther than Phedi and then changes into a comfortable and gentle trek towards the end of the day. 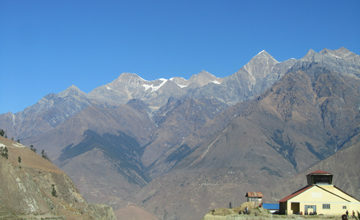 Yak Kharka is an hour away from Phedi. It is a wide seasonal pasture for the locals also has a couple of houses. 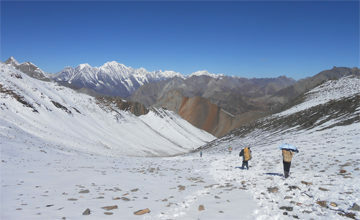 After leaving Yak Kharka, the trail comfortably traverses for half an hour. 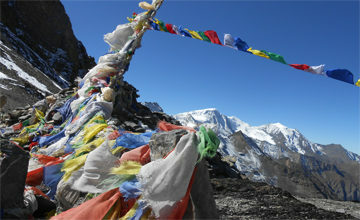 Then slowly, a steep climb starts and lasts for almost more than an hour until it reaches a stop with a prayer flag. Now, the climb eases and a huge waterfall appears on the opposite valley. Juniper trees and some fields appear near the trail and soon Rigmo village is seen. A bridge to cross the Phoksundo River flowing out of the Phoksundolake marks the entry to Rigmo village. 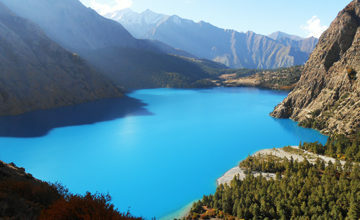 The campsite lies just outside of Rigmo village and right next to the Phoksundo Lake. Rest day at Phoksundo Lake. The day can be enjoyed by the side of the majestic lake. There are also few monasteries in the village for day visits. 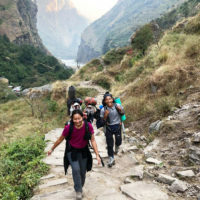 The trek now starts to go through the valley carved by Phoksundo River. Around 2 hours of descent leads to Jharana Hotel. Now the trail stays with or near Phoksundoriver until the end of the trek. 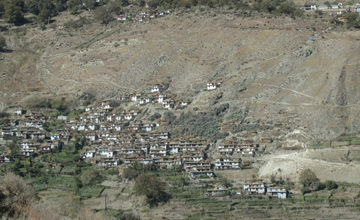 A comfortable trek with small ascends and descends takes through a small settlement of Rechi. The whole day after Jharana Hotel is in a narrow valley. After Rechi it takes around 3 hours to reach Chepka. Chepka is a bigger and wider place compared to Rechi. 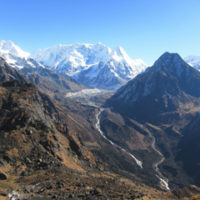 The trek follows the same pattern as of the previous day and continues in the same valley. The trail goes through small settlements of Sangta and Kageni en route to Sulighta. Finally the valley widens up after Sulighat and the trek head towards Dunai by the bank of Bheririver. 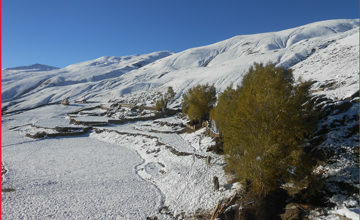 The trail follows Bheririver and there is a final climb of around an hour to reach Juphal, the ending point of the trek. 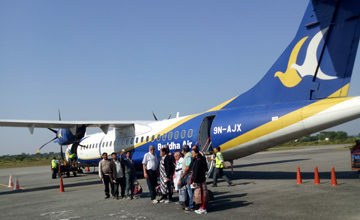 A morning flight to Nepalgunj is followed by an evening flight to Kathmandu. Also an extra day in case of delays or cancellation of flights. Airport transportation, Arrival, and departure Land transport. 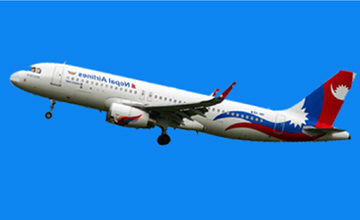 Kathmandu – Nepalganj – Juphal and Juphal- Nepalganj – Kathmandu domestic flight. 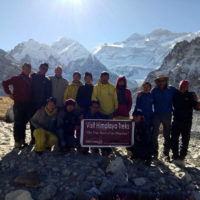 Experience climbing Sherpa and Guide. Climbing gears like rope, ice bar etc for the Norbung Kang Peak Climbing. Norbung Kang Peak Climbing permit and all government taxes. Good quality high altitude tents while climbing the Norbung Kang Peak. Climbing Bonus, tips, and personal nature expenses. Applicable permit fees and customs charge for Sat phone, communication equipment, and commercial filming while on Norbung Kang Peak Climbing. Climbing gear for peak Climbing Trips. Gaiters (Please make sure your gaiters fit around the plastic boot without being too tight around the boot. 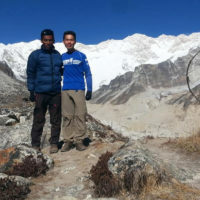 )Note: Walking pole, down jacket, sleeping bag etc are available on hire in Kathmandu.